Firm pillows I like them. These are very reasonably priced king size pillows. As they are “soft”, they are not fluffy at all. Rather flat and very floppy. I have another brand soft king size pillow that is a little more robust, and fills out the pillow case better, hence the four stars. However, they are soft and comfortable. It’s really hard picking out pillows period, but to pick them online is so hard. I’m so thrilled with my purchase. They are nice and fluffy and I’m so happy with them! I wanted to get away from down due to dust mite allergies and also to not buy animal products. This pillow is soft. We bought the firm for the pillows that match the comforter and the soft ones for sleeping. Very happy with the purchase. I am very pleased with the hotel collection pillows. I think the hotel collection is wonderful. It’s like sleeping in a nice hotel with very nice quality. Pillows hold up really well. Comfortable, not too soft or firm. Best pillows I’ve had since my moms chicken feather pillow I slept on for years finally wore out. This pair of king sized pillows were delivered today.I was excited to get this,it was flat but within a few minutes out of the package it expanded.It is very firm but cushy and I am planning on using it tonight .My old pillow was flat and gives me neck pain. Everything I wanted in a pillow and more, feather-like soft and conforms to your body easily, also has some kind of a cooling effect. I have a queen size bed so this is kinda big for my bed, but that’s just how I like it. I’ll buy it again. So terribly disappointed in these pillows. I have had bad neck and back problems every since. Going to buy new pillows this week! the filling separates and you end up sleeping funky. Great for side sleepers. 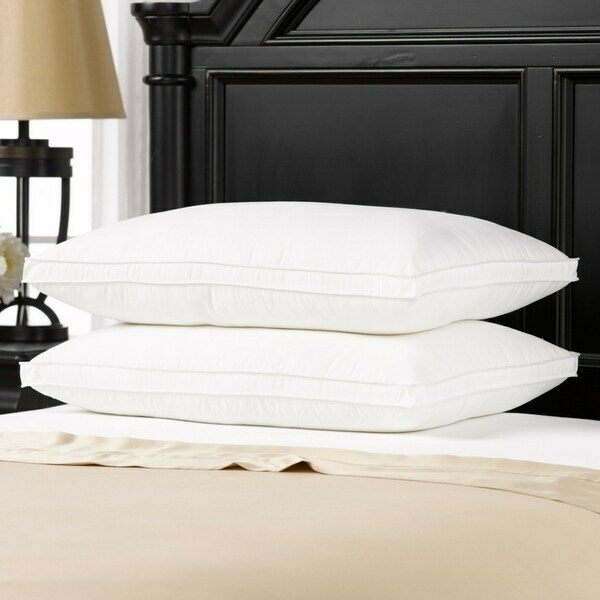 I bought the firm and these are my first really nice pillows and they are great! Wonderful pillows. I will order more soon! It’s a thrill to lay my head down on these pillows every night. Much more comfortable than I expected. Love! Solid and comfortable. Easy to adjust to where you are comfortable. I didn’t like these pillows they were to mushy. These were another purchase for myself after buying two as a gift. Wonderfully supportive, & the loft stays with it. Good for side sleepers. The pillows are great, exactly what I expected. I ordered these for our bed because I need a better support for my neck.Hopefully this will meet my expectations. "I'm looking for a soft pillow. Are these pillows firm?" Yes they are very firm. I really like these pillows and so does my husband. We got them in king size, but are using them on a queen bed. This pillow may be too firm for you if you prefer a soft pillow.